As the result of aggression by the Republic of Armenia against the Republic of Azerbaijan, during the 1988-1994 period, serious material damage has been inflicted, currently estimated at $22 billion dollars. Occupied regions of Azerbaijan has been totally destroyed and robed. The great economic damage has been inflicted also to 4 regions of Azerbaijan bordering with Armenia, 4 regions bordering with the Line of Contact and the territories of the administrative regions of the Nakhchivan Autonomous Republic. From the beginning of the aggression against Azerbaijan, more than 877 settlements have been burned and destroyed. In the late 18th century, several khanates [Azerbaijani states], including Karabakh [founded in 1747], emerged in the south Caucasus to challenge the waning influence of the [Iranian Empire and] Ottoman Empire. After the Russian Empire eventually took control over the region in 1813, Azerbaijani Turks began to emigrate from Karabakh while the Armenian population of mountainous (Nagorno) Karabakh grew. With the 1917 Russian Revolution, Azerbaijan and Armenia each declared independence [in 1918] and sought control over Karabakh during the Russian Civil War. 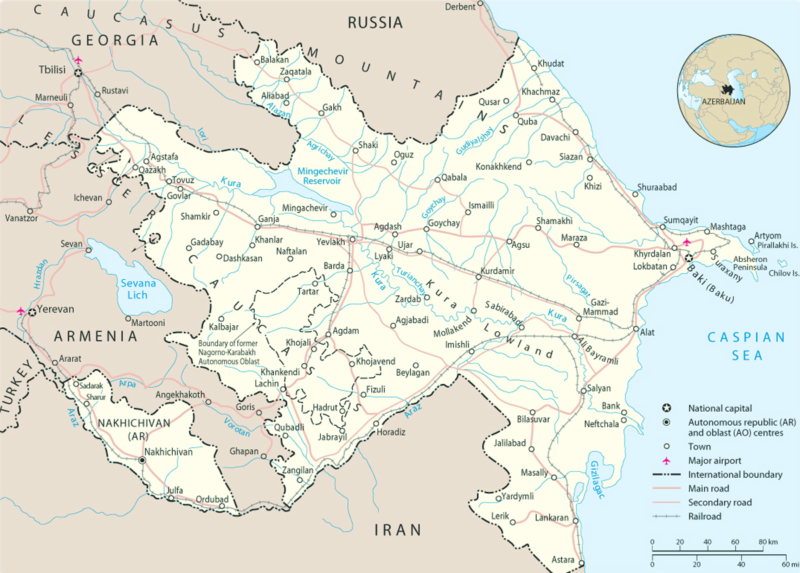 In 1923, after the Bolshevik takeover of the Caucasus, Nagorno-Karabakh (NK) was made an autonomous region [NKAO] within the Azerbaijani Soviet Republic. Soviet control temporarily quieted ethnic tensions. By the 1980s, NK’s population was about 75% ethnic Armenian, with most Azerbaijanis living in the district and city of Shusha. [According to the last official Soviet census (1989), 91.7% of population of Shusha district and 98% of the city Shusha were ethnic Azerbaijanis. Since 1992, all were either killed or became refugees (IDPs) It is important to note the spiritual, cultural and historical value of Shusha and Karabakh region to all Azerbaijanis. According to Encyclopedia Britannica: “The people of Azerbaijan have retained their ancient musical tradition. For example, the art of ashugs, who improvise songs to their own accompaniment on a stringed instrument called a kobuz, remains extremely popular. Mugams, vocal and instrumental compositions, are also widely known, the town of Shusha being particularly renowned for this art”]. The violence increased dramatically after the withdrawal of Soviet troops. Over 30,000 people were killed in the fighting from 1992 to 1994. In May 1992, Armenian and Karabakhi forces seized Shusha (the historical, Azerbaijani-populated capital of the region) and Lachin (thereby linking NK to Armenia). By October 1993 Armenian and Karabakhi forces eventually succeeded in occupying almost all of NK, Lachin and large areas in southwestern Azerbaijan. As Armenian and Karabakhi forces advanced, hundreds of thousands of Azerbaijani refugees fled to other parts of Azerbaijan. In 1993 the UN Security Council adopted resolutions calling for the cessation of hostilities, unimpeded access for international humanitarian relief efforts, and the eventual deployment of a peacekeeping force in the region. The UN also called for immediate withdrawal of all ethnic Armenian forces from the occupied territories of Azerbaijan. Fighting continued, however, until May 1994 when Russia brokered a cease-fire. (Source: U.S. Department of State, History of the Nagorno-Karabakh Conflict, March 30, 2001. Abridged version with comments by ASA). ”An appropriate analogy with the Jewish Holocaust might be the systematic extermination of the entire Muslim population of the independent republic of Armenia which consisted of at least 30-40 percent of the population of that republic. The memoirs of an Armenian army officer who participated in and eye-witnessed these atrocities was published in the U.S. in 1926 with the title ‘Men Are Like That.’ Other references abound.” Rachel A. Bortnick – The Jewish Times – June 21, 1990. To find out more about Armenian aggression and occupation of Azerbaijani territories, as well as all ASA activities and how to help, visit official website of ASA: usa.azeris.org. Researchers can also visit Karabagh.com and Khojaly.net websites for more information.